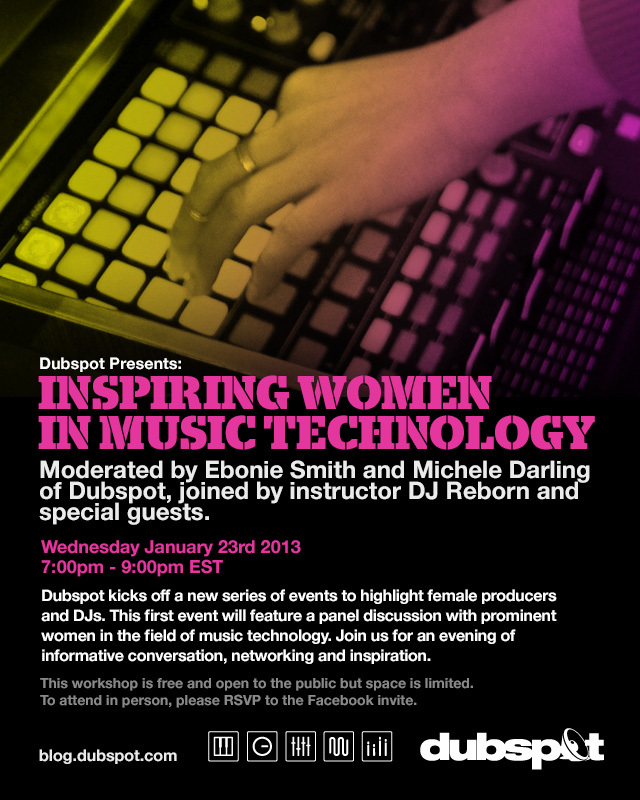 Dubspot kicks off a new series of events to highlight female producers and DJs! This first event will feature a panel discussion with prominent women in the field of music technology. Join us for an evening of informative conversation, networking and inspiration. The mission of our new Women in Technology series is to foster a supportive environment for women to explore music technology, learn about music production and DJing at Dubspot, and share their experiences. Join us and be a part of a growing movement of energetic and enthusiastic women technologists. These events are intended to help with networking and provide resources and mentoring. This first event will be held on January 23rd, 2013 at 7pm. If you want to attend, please RSVP on our Facebook event page. The event is free and open to the public but attendance at this first event is limited to women only.